So this is the movie that apparently invented the PG-13 rating, along with Indiana Jones and the Temple of Doom. It is easy to see why. Gremlins is not scary enough to earn an R rating, but it is also not a family friendly PG movie either. 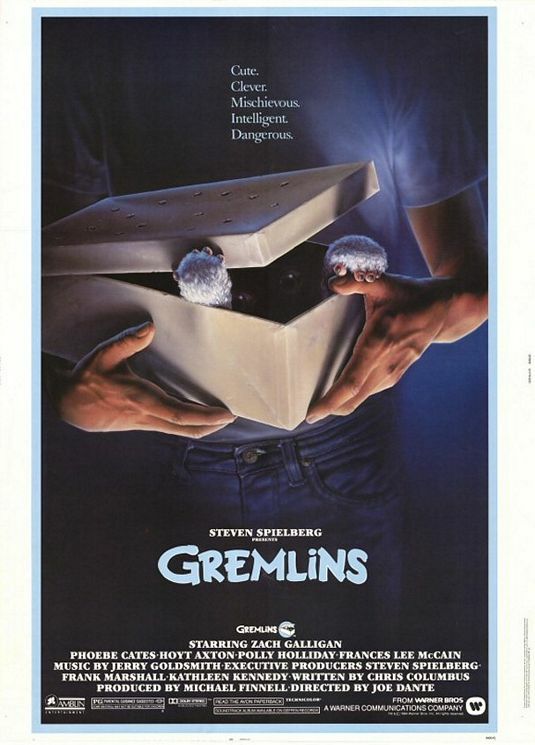 Gremlins is the story of Billy (Zach Galligan), a high student in a small town near New York. One Christmas his inventor father (Hoyt Axton) brings him a new pet called a mogwai that he bought from an old Chinese antique shop. The mogwai is a fun loving, cute and furry addition to the family. Billy is grateful for his new pet, naming him Gizmo, but his father tells there are three very important rules he must follow. So we all know the rules– don’t get them wet, don’t put them in the sun and don’t feed them after midnight. These rules are pretty ridiculous when you think about it. Especially the after midnight one. It is always after midnight, and when does it stop being after midnight and they can eat again? Nevertheless, these rules are obviously broken or we would have no movie to speak of. When Gizmo gets wet, he multiplies and 5 new mogwai appear. The new ones are not as nice as Gizmo, acting quite mischievous. They eventually manage to eat after midnight, turning from cute furry mogwai into slimy gremlins and start causing havoc around the city. Billy and his girlfriend (Phoebe Cates) must put a stop to these gremlins using their weakness, which is sunlight, amongst other things. I enjoyed Gremlins, but it is definitely not my favourite film. It feels like a cute horror film, and that is really hard to pull off. It’s probably too scary for kids, and not scary enough for adults. It ends up in this kind of limbo that struggles to satisfy any of its target audience. I really like the concept of this film, and I enjoy the sequel a lot more that went in a different direction and is more of a comedy than its predecessor. The effects do not look great now either. The gremlins look very dated now and anybody watching it today would be distracted by the poor quality. Gremlins is a good concept, but struggles because it can’t decide if it wants its audience to be kids or adults. When it comes to horror films, it is very difficult to have both. I think this is one of those movies that I missed the boat on by never watching it as a kid. Though, there is no way I would have been allowed to see this as a kid. It’s too scary, too gruesome, too violent… It makes perfect sense that the PG-13 rating was created in part as a response to this movie. Gremlins is a strange movie. It employs a fantasy plot that should appeal to small children (a boy receives an exotic pet called a “mogwai” for Christmas that ends up being more trouble than anyone could have imagined), but quickly devolves into a black comedy. It is definitely not for kids. The horror is too scary for them, especially when the mogwai start multiplying into hundreds of disgusting gremlins. There’s also the charming tale of why Kate (Phoebe Cates) hates Christmas, a story involving her father dying while attempting to come down the chimney like Santa Claus. It’s all very inappropriate for children, so much so that I wonder if they were the intended audience. However, this doesn’t feel like a movie for teens either. It’s just too silly, and the scary parts aren’t scary enough. Maybe I’m viewing this movie too much through a modern lensWh, though. It’s possible that pre-teens in 1984 were genuinely frightened by a this, but kids today have likely seen much worse before they’re 10. What’s more, the special effects haven’t aged well either. Again, they probably looked great by 80s standards, but kids now would probably find the effects funnier than the jokes. While I can give Gremlins points for originality and taking chances, the overall effect falls flat. It struggles to identify its audience, which is a big problem.